If you’re part of the Peirce College community, then you’ve long since figured out that 2015 is a BIG year for Peirce – it’s our 150th birthday! It was September 17, 1865 when Thomas May Peirce first realized his dream of opening a school aimed explicitly at educating adult students on business principles. A lot of things have changed over the last 150 years -- Peirce College didn’t have a blog or online classes back then, for instance. In fact, we weren’t even called Peirce College. Thomas May Peirce first called his school the Union Business College. However, from our very first day open, regardless of our name, Peirce College has been a business college for working adults. 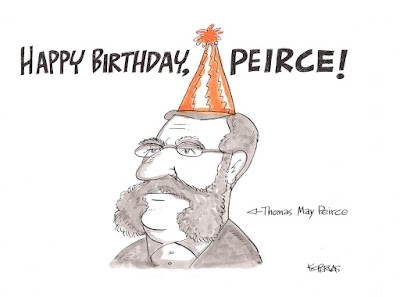 One hundred and fifty years later, Peirce College is still delivering Thomas May Peirce's uniquely practical, useful approach to higher education to adult learners in Philadelphia. To celebrate Peirce's history of delivering innovative career-based educations across three different centuries, we hosted three different events during our 150th Celebration Week. A 3 k Fun Walk on September 12th brought together Peirce community members to visit the College's previous historic locations around Center City, Philadelphia. A few days later we celebrated with our Legacy of Leadership Executive Breakfast kFounder's Day Party on September 17th, when Peirce College alumni, students, partners, trustees, staff, and faculty came together for our biggest-ever birthday celebration. Alumna Anita Vogel was awarded the President's Engagement Award for her commitment to Peirce. If you made it out to any of these events, thanks for joining us in the celebration! But even if you weren’t able to be with us in person, don’t worry. 2015 isn’t over yet, and we’d still love to hear from you. Sign our birthday card today and wish Peirce College a happy 150th birthday!